When we were deciding where to go to brunch the next morning after a wonderful meal at Matyson, we assessed menus from an array of various choices offered to us by Dani. But I went a little further than that, and I am guilty of this with literature and bottles of wine -- my final decision rested with how clever/meaningful the restaurant/cafe's name was. 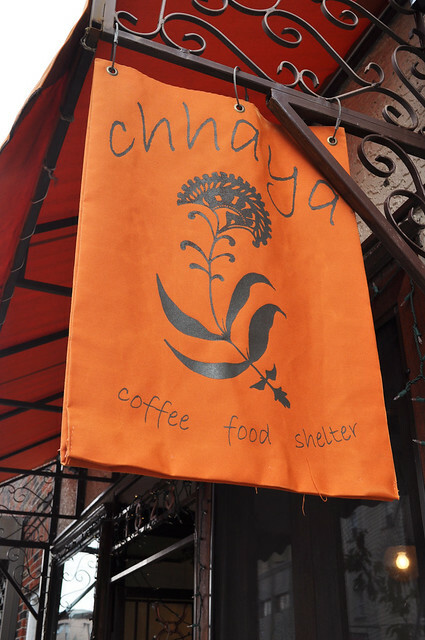 Chhaya Cafe, therefore, was the clear winner, because its name is three-fold, i.e., different yet unifying meanings in three different languages. In Sanskrit, chāyā (छाया) means shelter, shade, or shadow); in Hebrew, hāyā(חַיָה) means living or life from the word (c)hai (חַי), like in l'chaim; and in Japanese, 0-chāyā (お茶屋) means tea shop or teahouse. 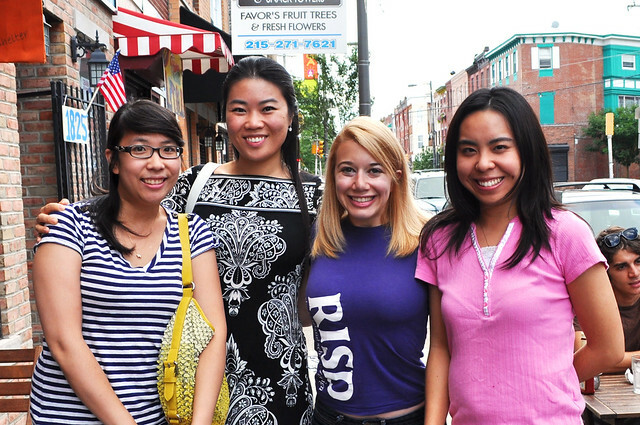 With all that being said, we met up with another old high school friend, Wendy, for brunch. 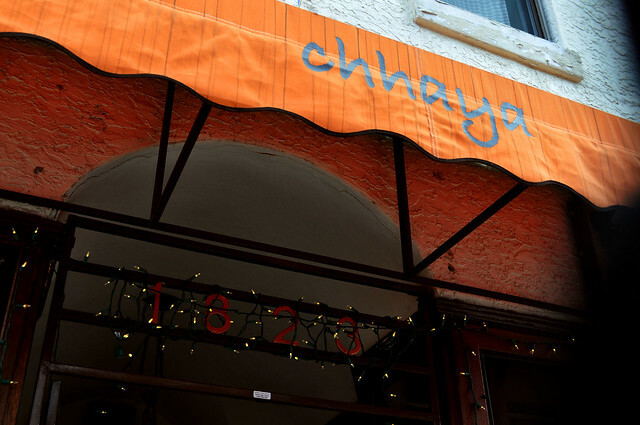 On top of the regular menu, Chhaya offers daily specials written on a black clipboard in chalkboard marker. 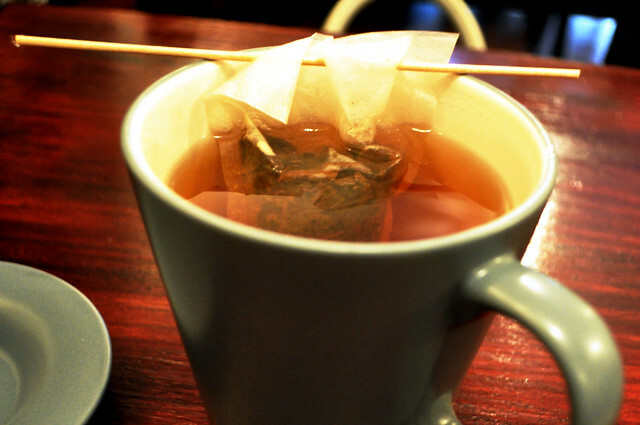 Lisa and I both had a cup of tea -- an earl grey blend with lavender. I thought the tea bag holder was very clever. I ordered the eggs en cocotte from the specials board -- baked eggs with wilted greens, cheese, chives, and brioche points. While the baked eggs were quite good (can't ever really go wrong with baked eggs), the brioche points were what made this dish so awesome. They were the perfect vessel on which to eat the baked eggs -- buttery, thick, and flaky. Lisa had pancakes with strawberries, blueberries, and blackberries. 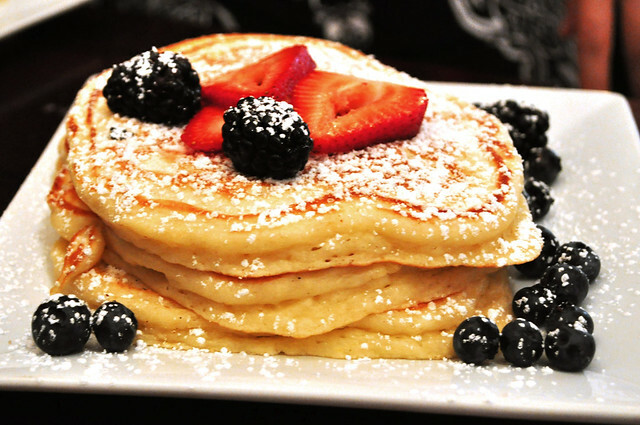 Chhaya has bragging rights to arguably claim that they make the fluffiest pancakes in Philly. But don't let the fluffiness fool you -- they are very filling! 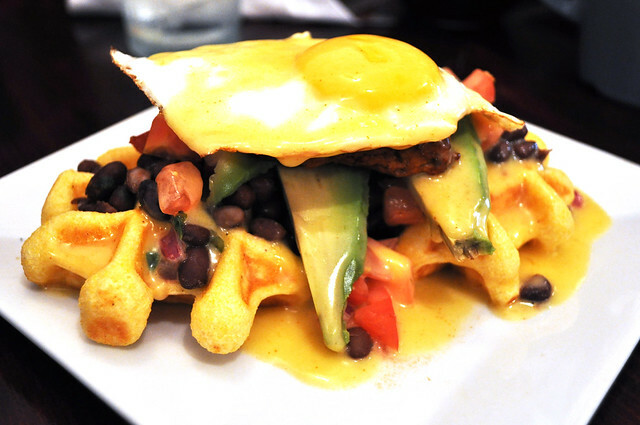 Dani had the huevos rancheros waffle from the specials board -- cornbread waffle, salsa, black beans, avocado, chorizo, a fried egg, and hollandaise. This dish ultimately combined the best breakfast options of all time -- huevos rancheros (Dani's favorite), eggs benedict (because of the hollandaise), and a Belgian waffle (only made from cornbread). Needless to say, this was the best dish we ordered that morning -- who can say no to avocado, chorizo, a fried egg, AND hollandaise all over a waffle?! Loved this refreshing twist on huevos rancheros. Wendy had crepes with blueberry compote. 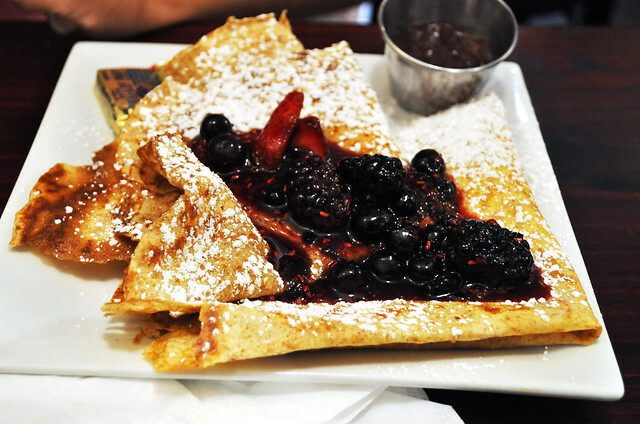 The crepes themselves were super crispy -- you can tell by their browned edge, and the confectioners sugar meshed well with the thick blueberry compote, adding a sweet-and-tart taste to the warm, crisp crepe. Me with Lisa, Dani, and Wendy at Chhaya. 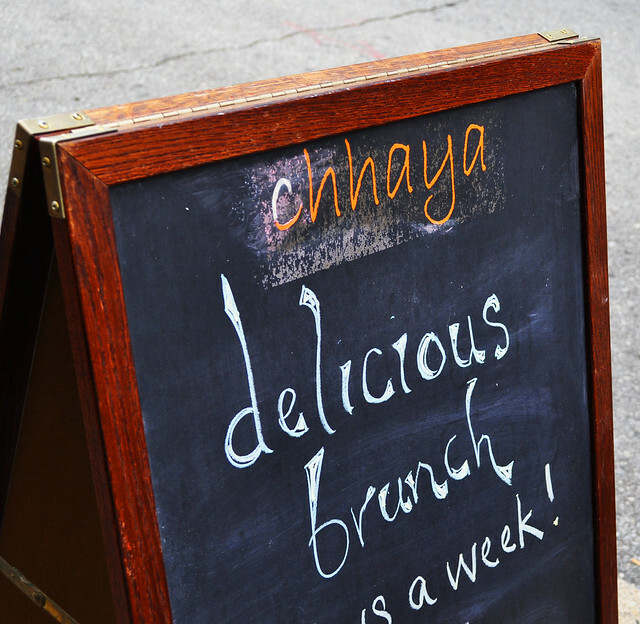 Findings: Overall, the brunch menu offered at Chhaya was quite variegated and equally delicious. For such an intimate cafe as itself, it was nice to be able to choose from a relatively wide selection of things, even in a given brunch category (many types of waffles, pancakes, and crepes), along with the creative specials offered daily. The price point was also very reasonable (about $10-15 per person) along with the wait time (it wasn't too crowded, even at prime brunch hour and if all tables were full, the next available table would be ready shortly). I also liked that brunch at Chhaya isn't super pretentious and "scene-y" as it seems to be in New York City. Sometimes it's okay if you don't want to get sloshed at brunch hour, especially if you just want a nice hot beverage with some really heartily delicious brunch fare. 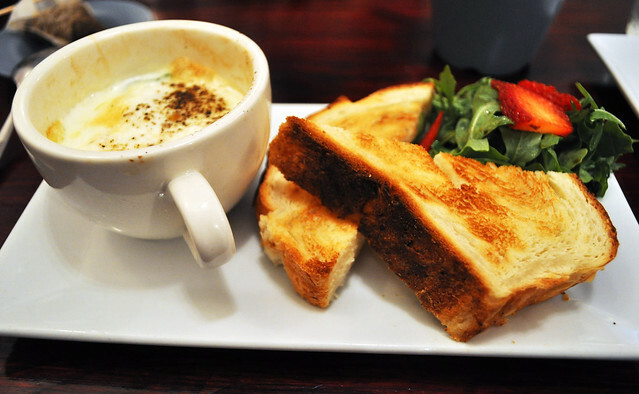 Price point: $6-12 for each brunch main course, $2 for each cup of tea. 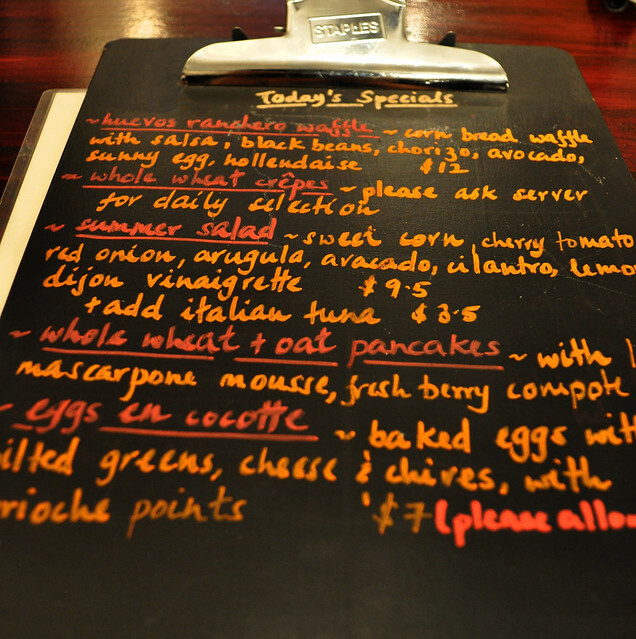 Can't really go wrong with any brunch main course here, especially anything from the daily specials board.